We’d love your help. 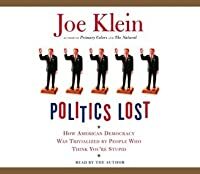 Let us know what’s wrong with this preview of Politics Lost by Joe Klein. People on the right are furious. People on the left are livid. And the center isn’t holding. There is only one thing on which almost everyone agrees: there is something very wrong in Washington. The country is being run by pollsters. Few politicians are able to win the voters’ trust. Blame abounds and personal responsibility is nowhere to be found. There is a cynicism in W People on the right are furious. People on the left are livid. And the center isn’t holding. There is only one thing on which almost everyone agrees: there is something very wrong in Washington. The country is being run by pollsters. Few politicians are able to win the voters’ trust. Blame abounds and personal responsibility is nowhere to be found. There is a cynicism in Washington that appalls those in every state, red or blue. The question is: Why? The more urgent question is: What can be done about it? There are many loud and opinionated voices on the political scene, but no one sees or writes with the clarity that this respected observer brings to the table. He has spent a lifetime enmeshed in politics, studying its nuances, its quirks, and its decline. He is as angry and fed up as the rest of us, so he has decided to do something about it—in these pages, he vents, reconstructs, deconstructs, and reveals how and why our leaders are less interested in leading than they are in the “permanent campaign” that political life has become. The book opens with a stirring anecdote from the night of Dr. Martin Luther King Jr.’s assassination. Klein re-creates the scene of Robert Kennedy’s appearance in a black neighborhood in Indianapolis, where he gave a gut-wrenching, poetic speech that showed respect for the audience, imparted dignity to all who listened, and quelled a potential riot. Appearing against the wishes of his security team, it was one of the last truly courageous and spontaneous acts by an American politician—and it is no accident that Klein connects courage to spontaneity. From there, Klein begins his analysis—campaign by campaign—of how things went wrong. From the McGovern campaign polling techniques to Roger Ailes’s combative strategy for Nixon; from Reagan’s reinvention of the Republican Party to Lee Atwater’s equally brilliant reinvention of behind-the-scenes strategizing; from Jimmy Carter to George H. W. Bush to Bill Clinton to George W.—as well as inside looks at the losing sides—we see how the Democrats become diffuse and frightened, how the system becomes unbalanced, and how politics becomes less and less about ideology and more and more about how to gain and keep power. By the end of one of the most dismal political runs in history—Kerry’s 2004 campaign for president—we understand how such traits as courage, spontaneity, and leadership have disappeared from our political landscape. To ask other readers questions about Politics Lost, please sign up. this is pure dead on, like. not sure i'm with klein 100% politically, but that should be the last reason not to like someone's book, if it's thoughtfully and well written. and this one has none of the partisan bickering and hysterical witch-huntery about it. he's diagnosing the political disease we're all sick of having but are collectively doing very little about treating: the cynical, superficial and synthetic circles of PR- and TV-driven political life in the u.s. he gets at the media (tricky, this is pure dead on, like. not sure i'm with klein 100% politically, but that should be the last reason not to like someone's book, if it's thoughtfully and well written. and this one has none of the partisan bickering and hysterical witch-huntery about it. he's diagnosing the political disease we're all sick of having but are collectively doing very little about treating: the cynical, superficial and synthetic circles of PR- and TV-driven political life in the u.s. he gets at the media (tricky, since he's of the media), the voters, the consultants, and - ultimately - the politicians. if politics is driven totally by focus groups and the constant campaign, how the hell is anything gonna get done? how is anything honest and meaningful gonna get said? klein's point is that it's not. until the pressure to perpetually campaign and to toe the lines drawn by professional politicoes is lifted (something he challenges politicians to do themselves), it's very hard to see a damn bit of truth or effectiveness or actual bi-partisan progress coming out of the government. one of the major ways i disagreed with klein was his marginalisation and dismissal of fringe (or 'vanity', as he calls them) campaigns for the presidency, such as dennis kucinich or carol mosley-braun. it seemed in poor logic to sideline their efforts (just as kucunich was sidelined in the 2008 debate in las vegas) simply because they're not 'hard-hitters', and especially when his book was making valid points about the falseness of what constitutes a hard-hitting, winning campaign. granted, the sort of politics he's encouraging might just open the door for more candidates of that brave and out-spoken stripe; but that's more my reading of it than his intention. he makes some eerily obama-like predictions on his wish-list for the 2008 president (more eerily so since obama's never mentioned). and considering the non-stop finger-pointing, despicable attacks, and general impatience in the u.s. political scene since january '09, this book reinforced my want for things to slow down, move at a less manic pace, and made me want our capacity to wait and see, to take thing step by step, to be more generous. Klein describes how the business of polling and campaign advising has led most Presidential candidates to package and sell themselves rather than speak from the heart. The author provides a candid account of the U.S. political system and its personalities (1976 – 2004). Generally, he’s not impressed. Boiled down, I think his message is that national politics has become all about winning, and less about governing, leadership and integrity. Political consultants and their candidates now say what people want to hear. Or, they employ a full-suite of dirty tricks or use focus-group, consultant-tested bromides that are yawners (“jobs, education, health care, and bla The author provides a candid account of the U.S. political system and its personalities (1976 – 2004). Generally, he’s not impressed. Boiled down, I think his message is that national politics has become all about winning, and less about governing, leadership and integrity. Political consultants and their candidates now say what people want to hear. Or, they employ a full-suite of dirty tricks or use focus-group, consultant-tested bromides that are yawners (“jobs, education, health care, and blah-blah-blah” litanies). There’s not much new here with what Klein puts forward. The same impulses have been there all along, but in the media age, these have been magnified. Still, there has been one change in our political culture. Until the first Bush and the Willie Horton ad, there were norms that constrained what could be said or done to win. LBJ had bumped into this with his mushroom cloud ad in ’64 but pulled it quickly. The problem now is that advantage lies with those who are willing to go below the belt to win over those who play by the rules. That’s a problem for the Democrats today. The Democrats have another problem. “Ronald Reagan,” Klein writes, “had given his party the gifts of simplicity and clarity and a coherent belief system that could be explained in sentence fragments: Military Strength. Low Taxes. Traditional Values. The Democrats, by contrast, were the party of the complex, clause-draped sentence: ‘We need to spend money on Head Start Programs in order to….’” This has been said many times before, and Democrats still don’t get it. Spare me the Reagan-envy Ds who sowed the seeds of 2008 w/the de-reg 90s. I'm glad I have it in hardback in case I run into Klein in person. The stupidity part of his thesis was ok; if he'd just stuck to that I'd have given 1-2 more stars. Hard to believe he wrote Primary Colors /and/ this dreck. Otoh, appreciate an insider view from the Clinton admin. Sometimes fun, but obvious... and a tad hypocritical. Klein criticizes that favorite whipping boy, the mainstream media, for the sterilization and dumbing-down of contemporary politics. But of course, Klein is a member of the mainstream media, and he has certainly been a part of the problem he so vehemently decries. This was an interesting enough book but doesn't actually do what it claims to do in its subtitle. It provides a comprehensive history of polling and focus-grouping in American politics but stops short of analysing the cultural causes or implications of these trends. Still, an accessible enough read that didn't take too long to finish. "Sadly most politicians [today] are neither risk-takers nor leaders. They are followers--followers of convention, public opinion--and while leadership is an art, followship has become a science, measure in polls and focus groups." Joe is definitely one of, if not the leading long-time American political journalists. Accordingly, I read this book to take a peek into the inner workings of our political system. This book is a snapshot in time of the American political spectrum and in particular presidential politics as detailed by a man who's had his finger on the pulse for many years. The reader is offered an insiders view on how political messages are crafted, tested and delivered to the public. In addition, you will find y Joe is definitely one of, if not the leading long-time American political journalists. Accordingly, I read this book to take a peek into the inner workings of our political system. This book is a snapshot in time of the American political spectrum and in particular presidential politics as detailed by a man who's had his finger on the pulse for many years. The reader is offered an insiders view on how political messages are crafted, tested and delivered to the public. In addition, you will find yourself immersed in the details the last 20 years of presidential campaigns and the actors involved. The interesting thing about this book is that near the end, I discovered that it was likely the publisher that added the subtitle "How American Democracy was trivialized...". It must have been, because that bit of info is not to be found. If anything, it should have been "...by people who think [The Candidate] is stupid. That seems to be much more the gist of the book, how candidates have given too much power to their consultants rather than relying on their own hunches. 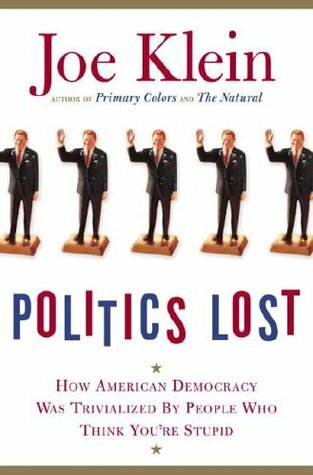 Another example that the The interesting thing about this book is that near the end, I discovered that it was likely the publisher that added the subtitle "How American Democracy was trivialized...". It must have been, because that bit of info is not to be found. If anything, it should have been "...by people who think [The Candidate] is stupid. That seems to be much more the gist of the book, how candidates have given too much power to their consultants rather than relying on their own hunches. Another example that the subtitle doesn't fit the book is the fact that klein seems impressed at times with the consultants, and argues for their necessity, even. It was an interesting backside view of all the presidential campaigns since George Bush Sr. I enjoyed hearing about how campaigns are run and helped me understand some of the decisions that were made that seemed stupid up front. The title isn't very accurate because the author spent very little time on that subject. Insightful and easy-to-digest look into how political consultants have shaped modern-day politics. I'm by no means a political junkie, but I got a lot out of this audiobook. For me the most interesting parts dealt with the Gore and Kerry campaigns in the early 2000s and how the consultants essentially neutered the candidates by forcing them to play everything safe. I will be honest and say I was moved to tears a few times reading this book. I know, I know, I'm a sucker. But some of the Kennedy speeches, those that were given without preparation, without profiling the audience etc. It just made me so sad that we have lost this spirit in our presidential and local races. It's an inspiring book, and it will also leave you longing for what we've lost. This is my kinda book. The history of the post war spin doctors in the presidential political races. Very interesting on how they got these guys elected. If you like politics and the inner workings of a political campaign, then this is an excellent book. I don't think Klein's thesis is quite clear here. But it is an interesting insider's look at campaign consultancy, and very readable. He'll always have a place in my heart...somewhere behind Paul Krugman. This is much more intelligent and informative and worthwhile than the silly title would suggest. It's an insider history of the American political process in the television age. Not especially ideological or partisan, and not a rant, except maybe in the short final chapter. This is a good book. One of my all-time favorite books, this chronicles the rise of the campaign industry, chronicling how money became so important in politics. To understand the roots of "Citizens United," one must only read this book. Joe Klein's take on political handlers since Pat Caddell - mostly Democratic campaigns with stories full of gossipy inside info with tons of players and their role. Really well written. Klein is a columnist for the NY times and thus is a good writer. An interesting perspective on the lost art of politics. Mostly he blames T.V. and I must agree. Strong prose. Hangs together well. Left-centrist perspective; you don't get the impression that he has a blind spot where the GOP is concerned. A little dry in the beginning but stick with it- it gets better! Interesting insights into the changes in politics and the power of polls and sound bites. What a wonderfully down to earth book. Joe Klein writes of the transition of the political process from issue based to character (i.e. PR) based.